In the past, virtually all methods of pest bird control have also been perceptible to humans. From bird nets and spikes to audible bird scaring deterrents, people see or hear these installations in exactly the same way that pest birds do. Now, though, there is a brand new method of pest bird control which draws on the latest scientific developments, as well as employing some bird psychology: bird free gel. How Does Bird Free Gel Work? Unlike humans, birds are capable of seeing ultraviolet- and the bird free gel is therefore made with this in mind. When a person looks at it, they will simply see a small, almost unnoticeable pot of gel. To a bird, though, this gel is surrounded by ultraviolet waves which they will perceive as fire. When the gel is spaced out, it will seem to the pest birds as if the entire building is aflame. Naturally, all of their instincts will be telling them to keep well away from this potential danger, and they will thus fly far away from your building. For extra impact, the bird free gel also gives off an odour which is undetectable by our less sensitive noses, but which birds absolutely hate. Combined with the alarming appearance of the gel, this will ensure that they don’t come anywhere near the area. One of the biggest advantages of bird free gel is that it lives up to its name and works on all species of pest birds. From feral pigeons and gulls to starlings, every bird will see the gel as a serious threat and know that this is not somewhere they want to roost. Unlike other pest bird control methods, though, bird free gel is unobtrusive and incredibly easy to install. It can either be fitted to the building with an adhesive or with strong magnets onto metal constructions like bridges. Once installed, the bird free gel will give instant results- but at just 8mm high, remain virtually invisible to people below. In addition, bird free gel is an extremely low-maintenance solution. Once installed, there is no need for you to do anything to it- just leave it on the ledge or rooftop and watch as birds fly away the moment they see it. Bird free gel can last for up to five years before it needs to be replaced and has been specially formulated to cope with even the most adverse weather conditions. Under heavy rain or even snow, the gel will still deliver the same great results year in, year out. It is a far more cost-effective solution than having to call in pest controllers to deal with an infestation, so bird free gel could end up saving you a lot of money over the long term. Discover the Benefits of Bird Free Gel for Yourself- Contact Pest Solutions Today! 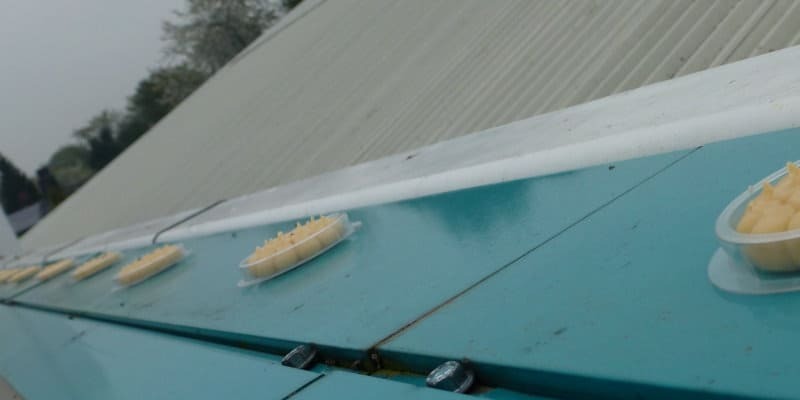 Whether you are looking for a pest bird control approach that won’t spoil the appearance of your building, or simply want to get the very best results, then bird free gel could be the ideal solution for you. Highly discrete yet remarkably effective, it offers everything you could ask for in a pest control method. What’s more, bird free gel is already being used by thousands of different companies across the world. From railway stations and hotels to stadiums and bridges, this incredible gel is perfect for keeping pest birds at bay for many years to come. At Pest Solutions, we are delighted to offer this innovative pest bird control product to our customers. In our experience, it delivers excellent results across a wide range of different pest bird species. It is also completely humane since the birds are simply warned away without coming into contact with the gel. In the rare event that they should touch the gel, the substance is entirely harmless and the smell and feel of it will deter even the most stubborn of pest birds. If you would like to find out more about how bird free gel can help you, as well as other alternative methods of pest bird control, then the Pest Solutions team are more than happy to help. We offer completely free, no-obligation surveys to assist you in figuring out the right approach for your property. In addition, all of our pest control technicians are highly trained, so you can rest assured that they will get the job done properly and keep pest birds at bay for good. It’s time to take your pest control to the next level. Call in the experts at Pest Solutions and let us take care of everything for you. Contact us on 0800 027 2555 to arrange your FREE survey today, or click here to find your local branch.